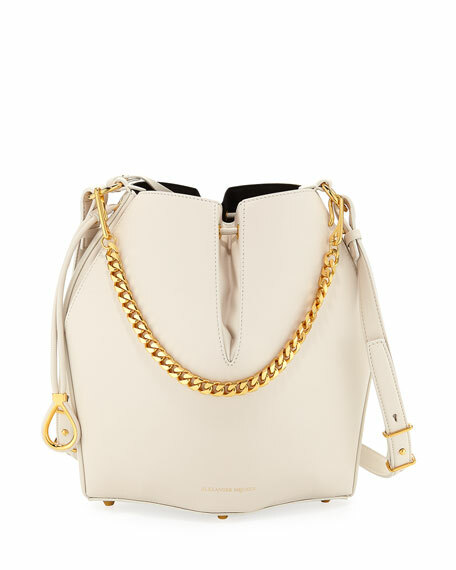 Alexander McQueen smooth calf leather bucket bag with golden hardware. Open top; drawstring closure with ring pulls. Embossed logo at center front base. Approx. 9.8"H x 13.4"W x 9.8"D.
"The Bucket" is made in Italy. Bottega Veneta "Olimpia" intrecciato woven metallic wool shoulder bag. Chain shoulder strap, 22.5" drop. Karung snakeskin and leather trim. Flap top with brassy knot ornament. Inside, divided center; one zip pocket. 6"H x 10"W x 4"D. Weighs 1lb. 15 oz. Made in Italy. Eric Javits "Aura" shoulder bag in signature Squishee?? fabric. Golden hardware. Leather shoulder straps with hanging logo tassel. Magnetic snap closure at top. Side slip pockets. Inside, fabric lining; two zip pockets and four slip pockets, key clip. 9.5"H x 11.5"W x 7.5"D. Feet protect bottom of bag. Imported. Eric Javits mixed fabric shoulder bag with leather trim. Flat shoulder straps wrap around body of bag. Open top with lobster clasp and snap closure. Exterior, logo patch at front. Interior, two zip compartments. Two slip pockets; key clip. 9.8"H x 15"W x 6.5"D. "Newport" is imported. Eric Javits satchel bag in signature Squishee?? material and leather. Metallic leather shoulder straps wrap around body of bag, 9"